Smart clothing has been getting quite a lot of attention, but not enough support to successfully fund Hiody's Kickstarter campaign. Could smart clothing be in for a more wrinkled ride than we think? What if you could throw on a comfortable hoodie and have your favorite music streamed directly through the sweatshirt? No need for speakers, no need for headphones. That is what Hiody, a new tech-infused piece of smart clothing, tried to provide to consumers. However, the Kickstarter campaign for the product recently concluded falling far short of its fundraising goal of $45,000. Hiody was designed to eliminate the fuss that comes with managing your smartphone on the go. The hoodie has a battery-powered Bluetooth module that allows it to connect with your phone, as long as it’s within 30 feet of the device. Small, 40 millimeter speakers embedded within the hood of Hiody allow you to listen to music and monitor incoming calls without having to glance at your phone. The magic is in the Control Button of Hiody, located in the center of the sweatshirt, slightly below the chest. The Control Button allows wearers to scan through songs on their playlist and answer phone calls as they come in via single, double and triple clicking. 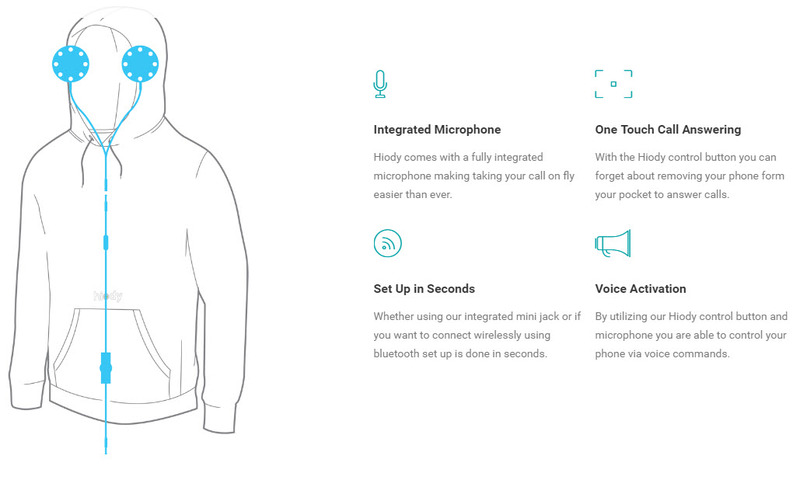 A small microphone located near the neck of the hoodie ensures that wearers can respond to calls as soon as they pick up. When it’s time to give Hiody a wash, users simply remove the speakers and Bluetooth module stored within zip pockets of the sweatshirt. The creators of Hiody guarantee that it takes just about 30 seconds to complete the task, meaning “laundry day” isn’t any more difficult. The Bluetooth module itself has a battery life of up to six hours. In the event that it needs to be used while charging, there is a MiniJack located within a side pocket to connect it directly to a smartphone for wired functionality. A wide range of publications picked up on Hiody as soon as its Kickstarter campaign launched just a few months ago. However, its creators canceled funding just last week after raising only $12,643 of the $45,000 needed to widely manufacture the first round of Hiodys. With a retail price of $129, backers were set to receive the sweatshirt at $69, assuming they participated in the Super Early Bird round of funding. Does this mean the end of Hiody? At a larger scale, does this indicate a fleeting interest in smart clothing as a whole? Although Hiody missed the mark, the smart clothing industry still looks relatively bright. 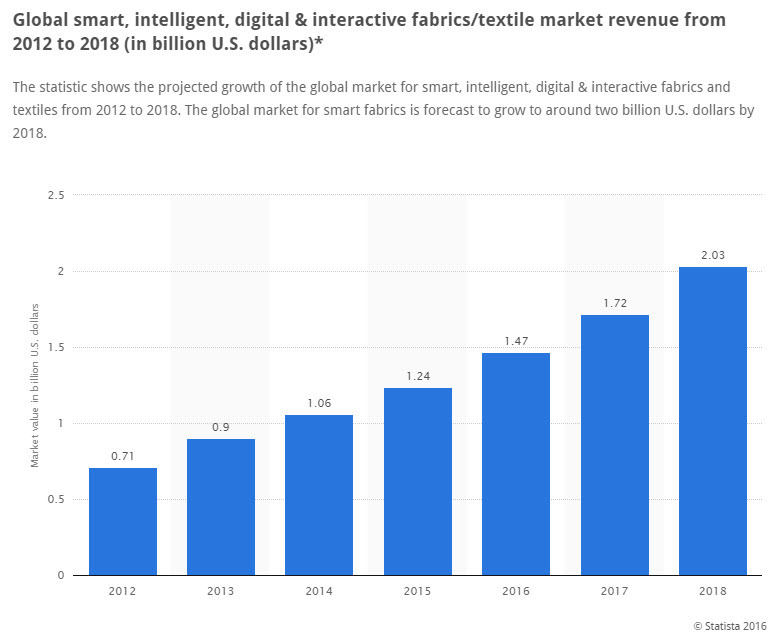 Research conducted by Tractica predicts that total shipments of smart clothing will grow from 968,000 units in 2015 to 24.8 million units in 2021. This excludes the body sensor sector, which will increase from 2.7 million to 68 million within the same time frame. The researchers note that this market will be primarily driven by the desire for more insight into health and well-being. For instance, consumers will continue to look for smart clothing to monitor everything from heart rate to pregnancy. This doesn’t necessarily mean that there isn’t room in the market for a product, like Hiody, which brings music to clothing. However, it does shed light on the fact that when consumers think “wearable tech,” health is what commonly comes to mind. The challenge will be making it come to body. There’s also the possibility that when it comes to comfortable clothing, simplicity is largest selling factor. Take The 10-Year Hoodie, for instance. This Kickstarter campaign made headlines when it raised more than $1 million for a sweatshirt designed simply to last 10 years. The manufacturer, Huckberry, commits to mending products that need repairs before the 10-year mark, free of charge. The hoodie doesn’t have any tech – just comfortable yarn fleece and oversized “kangaroo” pockets for items like smartphones. Today, The 10-Year Hoodie can be purchased on Huckberry’s website for $49.98. It’s noticeably cheaper than Hiody, but without Bluetooth capabilities, this may not come as a surprise. Of course, this isn’t to say that all tech-infused clothing is destined for failure. AiraWear, a muscle-massaging hoodie, doubled its Kickstarter fundraising goal of $75,000. The STX Hoodie, which uses shoelace earphones as drawstrings to connect to your smartphone, surpassed its fundraising goal by 210 percent back in February 2016. Finding success in the world of smart clothing isn’t impossible, but following existing trends might help. Keeping in mind consumers’ desire for wellness tracking, comfort and just plain value may be what an aspiring smart clothing product, like Hiody, needs to help itself over the hump. It might be a tough thing to see right now, but at some point it will take off and the company is going to get rich. There are few things that last a long time that took off like a rocket. Slow and steady. Just like with anything else that is “new” to the tech world. It will take time to get figured out and the companies that were in quickly are going to be learning from those that waited a little while before starting.